Obama's problem: Should offer of dialogue hold if protesters stay behind bars? (CNN) -- Protesters were on the streets of Tehran all week, demanding real democracy. Where, some people were asking, was U.S. President Obama? 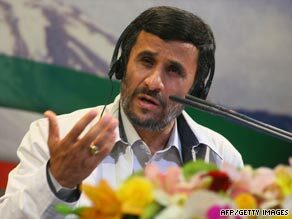 Protests in Iran over Mahmoud Ahmadinejad's election win pose a delicate diplomatic problem for U.S. President Barack Obama. "I do not believe that the president is taking the leadership that is incumbent upon an American president," said Republican Senator and Obama's former campaign rival John McCain. "That is to advocate for human rights and freedom and free elections." It was just two weeks ago that Obama proclaimed his support for democracy in a speech specifically addressed to the Muslim world. President Obama has been walking a tightrope since the disputed election, saying he doesn't want to be seen as meddling. Apart from its careful comments, the Obama administration's most concrete public step has been in cyberspace: After noticing heavy Internet use by Iranian opposition groups, the State Department asked the managers of the Twitter networking site to reschedule some planned maintenance, to keep Twitter running during peak hours. Overall, Obama says he's holding back because of America's history in Iran and its expectations for the future. The history dates back to 1953, when the Central Intelligence Agency helped organize protests and a coup against the country's elected prime minister, Mohammed Mosaddeq. The White House knows that if it supports the reformers too openly today, it could make it easy for the regime to discredit them as participants in another U.S. plot. The expectation is that no matter which side prevails, the relationship between Washington and Tehran isn't likely to change dramatically. Iran will still have a clerically-guided government, a nuclear program and supportive relationships with Hamas and Hezbollah. Since the first days of his administration, Obama has reached out to that government repeatedly, offering to begin a new dialogue. That creates another complication. If the protests fail, if opposition figures who've been arrested stay behind bars, should Obama still offer to talk to Iran's leaders in the same way? In his first formal television interview back in January, President Obama said that "If countries like Iran are willing to unclench their fist, they will find an extended hand from us." The events of the last week are hardly what the president was hoping for. Now, he has to decide what to do about them.